World’s largest urban bat colony captured from under the Congress Avenue Bridge in Austin, TX thanks to our friend Pamela Phillips. 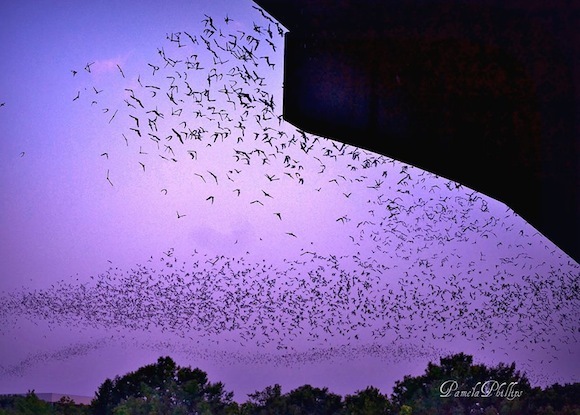 World’s largest urban bat colony captured by our Facebook friend Pam Rice Phillips in Austin, TX. The Congress Avenue bridge in downtown Austin is the spring and summer home to some 750,000 bats with up to 1.5 million bats at the peak of the bat-watching season. It’s the largest urban bat colony in North America. About 750,000 to 1.5 million bats call the Congress Avenue Bridge in downtown Austin, TX home. Every night around sunset spectators gather under the bridge to watch the bats swarm out from their home in search of food. Thanks for the great shot Pam! !